OSLO, NORWAY (March 27 , 2017) – Having travelled 5,000 miles from the United States to deliver an urgent message regarding the human rights and Indigenous rights violations in their homelands, the Indigenous Women’s Divestment Delegation to Norway and allies is pleased with the announcement from Norwegian bank, DNB, regarding the cancellation of its $2.5 billion USD credit line to fund the Dakota Access Pipeline (DAPL). Through inputs from diverse groups and an independent investigation, DNB confirmed the lack of consultation with the Standing Rock Sioux and violation of Indigenous rights. As a result, the financial institution has fully and completely divested from the project. The Indigenous Women’s Divestment Delegation to Norway, organized and supported by the Women’s Earth and Climate Action Network (WECAN) International in response to requests from frontline Indigenous women leaders, traveled to Norway late last week to share experiences from Standing Rock and request that financial institutions divest from DAPL and other fossil fuel developments, which threaten the cultural survival of their nations and peoples. In strategic platforms, the Delegation members are providing direct testimony on the impacts of extractive industries, oil spills, and contamination – particularly on women and children. The Delegation has called for immediate fossil fuel divestment and is encouraging the pursuit of investment in a just transition to renewable energy. The Delegation hopes DNB’s decision to divest will reverberate to the other 15 international banks engaged in DAPL and the Oil Fund to further actions for divestment in respect to human rights, inherent tribal sovereign rights, water rights, and treaty rights of Indian tribes in the United States. With DNB’s divestment announcement, the Indigenous Women’s Divestment Delegation to Norway helped tipped the scales of justice toward the standard of consultation and consent affirmed and recognized by the UN Declaration on the Rights of Indigenous Peoples. Today, Monday March 27, the Delegation will continue in action towards this goal during a meeting with the Council on Ethics of the Oil Fund. 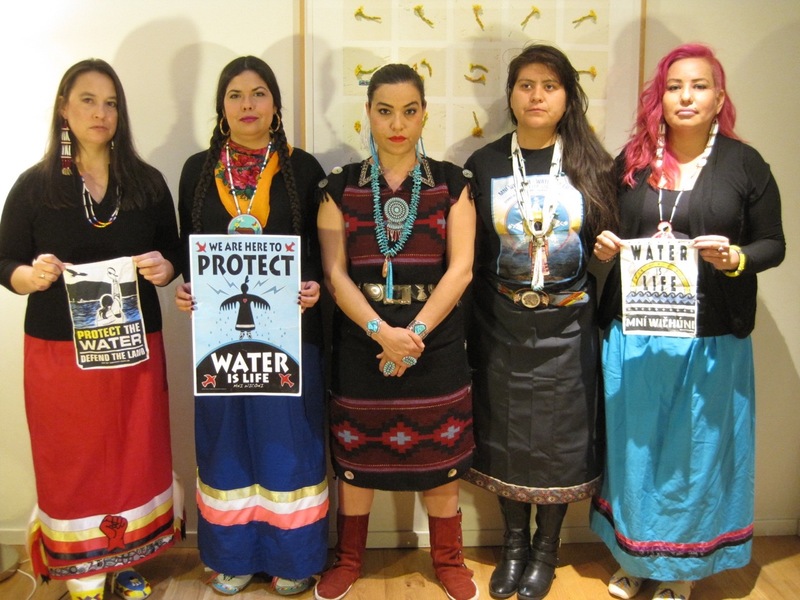 Later this week, public events and a press conference will be held during which spokeswomen will share their firsthand experiences from Standing Rock, and analysis of the recent DNB divestment. This entry was posted in Visionary Leadership and tagged Autumn Chacon, Dakota Access Pipeline, Divestment, LRInspire, Sarah Jumping Eagle, Tara Houska, Wasté Win Young by lrinspire. Bookmark the permalink.